Essentially, the souls of people IS the issue involved that is of greatest urgency to the Galactic Command or Confederation, for this saving of the souls is that which the spiritual forces perceives to be the real purpose and value. The physical body is temporal anyway, and has only a short time on earth, but the soul being permanent, being more or less eternal, is the more important concern. The Draconian and the Orion forces think that by making it appear the soul is just an illusion and that one's body is what counts, they find themselves able to influence people by fear and by coercion, based on bodily needs and preservation. And in this manner they actually capture the souls of entities who are trying to preserve their body and will do so at the cost of their soul"
Comedy indeed. How do you prove they are not Syrian Army people and posting these videos to deflect responsibility of their chemical weapon use and blaming it on the rebels. Look at the quality of the video and the person shooting the video one can feel that it was staged an nothing else. If indeed these were FSA fighters why would they record their incriminating activity, after all dont they want USA to intervene? At the same time it is a joke that USA and her allies talking about humanity when they have the worst record for WMD use, these include nuking japan, using Agent Orange and other chemical on Vietnam and its neighbors, using DUI rounds in IRAQ.. the list goes on. US is ready to strike and UK has landed jets in Cyprus. I will expect Israel to join in. I imagine USA and allies are confident that they will be able to finish off the chemical weapons that they are going to strike now. However, at the same time by announcing they are being arrogant in that they are telling Syria we are coming for you and we dont care if you have time to prepare your weapons. But mind you at the same time it is great tactic Syria will be scrambling to get their missiles ready with Chemical weapons thus in rush exposing the location of their chemical weapons for USA to strike at.. It will be interesting to see Syria's response and how Israel reacts to it. Some questions to be answered. 1. will USA strike Assad to kill him? 2. How will Hezbollah react?? will they unleash rocket fire on Israel?? It would be interesting to see how the events unfold in coming days. Answering your first question ... on NBC Nightly News last night they said it clearly ... They have NO intention killing Assad, plus they will NOT strike chemical weapons. [size=4](Ahlul Bayt News Agency) - Speaking to Kuwaiti newspaper Al-Rai Al-A&rsquo;am on Tuesday, senior Hezbollah officials underlined that any military intervention by the US or the West in Syria will result in a full-fledged war in the Middle East. &ldquo;The US attack on Syria will result in the reinvigoration of the Al-Qaeda in that country,&rdquo; they told the newspaper. Syrian Foreign Minister Walid al-Mualem said on Tuesday that Syria will press on with its military efforts despite any potential foreign strikes on its territory, adding that any strike would serve the interests of al Qaeda-linked rebel groups. "The war effort led by the United States and their allies will serve the interests of Israel and secondly the Al-Nusra Front," Mualem told a press conference in Damascus. "The (government's) military effort will not stop around Damascus. If the purpose is to limit the victories of our armed forces, they will not be successful," Mualem said. Any foreign strike on Syria to try to create a balance of power in the war between President Bashar al-Assad's forces and the rebels is "delusional", the foreign minister said. "If the purpose of a possible (foreign) military strike is to achieve a balance of power ... it's delusional and not at all possible," Mualem added. "If they wanted to attack Syria using claims - utterly incorrect claims - about the use of chemical weapons, I defy them to provide what evidence they have," he said. Russia warned on Tuesday that a military intervention in Syria could have "catastrophic consequences" for the region, and called on the international community to show "prudence" over the crisis. "Attempts to bypass the Security Council, once again to create artificial groundless excuses for a military intervention in the region are fraught with new suffering in Syria and catastrophic consequences for other countries of the Middle East and North Africa," a foreign ministry spokesman said, AFP reported. "We are calling on our American partners and all members of the world community to demonstrate prudence (and) strict observance of international law, especially the fundamental principles of the UN Charter," ministry spokesman Alexander Lukashevich said in a statement. Israeli are replacing old gas mask ... I think once they have replaced the mask then attack will start. The worst concealment they can do is to hire a Syrian general and use smuggled chems from Syrian army even in that case it is Syrian authorities only to bring the guilty to justice. In this case it seems it is the terrorists job walking around with chem bottles mainly. Hopefully this time world powers like Russia and China are aware of the real problem and for everyones future will prevent the repetition of the nato cases in Serbia Iraq ,Libya and others once again. it is said before Imam Mahdi's arrival, Syria will be in war or civil war or there will not be peace there. Imam Mehdi will appear in Mecca for the hajj. I've seen on the dates for this years hajj, the expected dates are 13-10-2013 till 18-10-2013. The 18th is a Friday, but Allah Knows Best if the dates are true. The US wants to attack Syria as it is the last stronghold of its foes Iran and Russia in the middle east. However I think that what has prevented such an attack till now is Israel. Israel does not want the rebels to defeat Assad. Assad kept the Syrian-Israeli border safe and actively prevented Palestinian refugees from using that border to attacks into Israel. Now the rebels consist of hundreds of groups with different objectives. Many of these groups will undoubtedly turn their guns on Israel if they manage to take control over Syria. This is the scenario Israel is afraid of. Assad is Israel's best bet in Syria. ^^ That is the reason who it will be limited attack ... meaning may last few days, just to send out an warning, without removing the Assad government. assuming after Syria falls maybe Lebanon is next? Many rebel groups consist of Palestinian refugees. Once they remove Assad and have a base to attack Israel, they will not think twice about it. This combined with the fact that if Assad falls, his cache of lethal weapons will also fall into the hands of these same rebel groups. Assad kept Israel safe all these years. Israel will not want to risk that. I don't think Israel is afraid. I think they have pushed US to attack syria and at the end of road Iran... The will put instability in syria and will be able to disable syrian menace. Israel is not frigthened by ragtag terrorists, Israel would not hesitate to launch a massive attack if any attack comes from syria's rebells groups. But they need to take out syrian air defence, missiles and air forces without any costs and have then more free hand to attack Iran. Israel has nothing to gain from removing Assad and everything to lose. Assad kept Israel safe for over a decade. The military of Egypt, dictatorship of Syria and monarchy of Jordan are vital for safety of Israel. These regimes have kept Israeli borders safe and secure. Similarly armed and equipped "ragtag terrorists" (hizbollah) gave Israel nightmares during the last conflict, and last thing Israel needs is another such group on another border. Something was preventing the west from attacking Syria for so long. The west did not take long to attack Libya and remove Gaddafi. Yet they waited fo such a long time and let hundred thousand people get killed and only now they are talking about limited strikes. Someone is clearly working to prevent an attack on Assad regime, someone influential. That someone is Israel. Just read the news, Jordan has said it will not allow its soil to be used for attacks on Syria. Just as I said in my previous post, the three Arab regimes in Egypt, Jordan and Syria are protectors of Israel. This is why despite being a US poodle, Jordan is against military action against Assad. Skull Buster Bro, i have to admit your analyze seems and is logical. What was the last thing going through Asad's mind? Asad you better run now. You roared like a lion killing women and kids, as did your disgusting father in the 80's. Now let's see you deal with this. From the word go, all they wanted was Asaad gone. I doubt they want to invade and occupy. Probably military or an interim govt. under the Saudi influence, and rid Syria of Hamas/Hizbullah. US will donate some 100 F-22/35's to KSA after. That will cut the link to Hizbullah support in Lebanon and isolate them. Experts say Saudi Arabia and Turkey are drawing the West into a war, and Russian arms will not help. The U.S. and its allies are likely to start bombing targets in Syria in the near future. Russian experts believe the real goal is not to destroy the country’s chemical potential but to reduce the combat capability of the government army and secure the victory for the armed opposition. They also point out that Moscow will have little time to help Damascus with weapons and should focus on diplomatic support, instead. "This military action will resemble the El Dorado Canyon operation against Muammar Gaddafi in 1986 — not a very long one, not a very costly one," Sergei Demidenko, an expert at the Institute of Strategic Studies and Analysis in Moscow, says in prediction. He is confident that the West will not drag out the air campaign, and it will not start an expensive ground invasion in Syria, either. According to Demidenko, the United States does not want to intervene in the Syrian conflict — this is not their war. The U.S. is being drawn into the conflict by Saudi Arabia, Qatar and Turkey. For these countries, the overthrow of Bashar al-Assad’s regime has become a matter of principle, though they are unable to achieve it on their own. The question arises: What will happen to targets in Syria that produce and store chemical weapons, if the claimed purpose of the military operation in Syria is the prevention of any further use of these weapons? "What is at issue here is not the bombing of locations for the storage or production of chemical weapons. If an airstrike is applied on some storage of chemical weapons, you can obtain a result that would be a lot worse than what it was during the recent attack near Damascus," says Andrei Baklitsky, an expert at the PIR Center. He contends that airstrikes would be applied on sites belonging to the armed forces — command posts and communication lines. Sergei Markov, a political analyst, also believes that Western armies will fight in Syria, in part as mercenaries of Arab monarchies. "We have a generally accepted view that the U.S. is acting in Syria through the hands of the U.K. and France; but it seems to me that everything is exactly the opposite. It is rather Paris and London who are the leaders, and Washington is following them — and with some resistance,” the analyst says. “The situation is similar to Libya's. However, in Libya, France at least had a mercantile interest (to gain control over the oil fields), whereas, in the Syrian situation, I think it is the banal bribing of the British and French governments by the Saudis and Qataris. And the money is being given at the government level in the form of contracts, as well as at the personal level,” says Markov. In this case, the West in Syria, in the pursuit of tactical advantages, is committing huge strategic mistakes, according to Markov. "Unfortunately, we are forced to live in a world where chaos grows strong, and so does the use of military force," the analyst says. "Our partners in Washington, London and Paris are committing gross blunders and acting against their own interests." "What did the U.S. win from the war in Iraq? Nothing. What did they win from the overthrow of Mubarak? Loss, nothing else. How did they benefit from the overthrow of Gaddafi? Is it the fact that they tore their ambassador to pieces?" says Markov. In these circumstances, the question arises: What can Moscow do in the days and weeks remaining before the intervention? Experts believe that the only option available on the diplomatic and public relations front is to continue the previous policy of appealing not so much to governments as to Western public opinion. "Russia needs to focus on the mission of the U.N. inspectors. It is the results of their work that will either give grounds for a military strike against Syria or an opportunity to raise a voice in protest," says Markov. "Secondly, we must conduct an intensive campaign among the world public opinion, because a bloated majority of people of the West are misinformed: They are being told over and over again that Bashar al-Assad has used chemical weapons. We should write and say that this was an obvious provocation, and that it was the opposition who committed the chemical attack," the expert says. Some Russian politicians believe that Moscow should limit itself to diplomatic efforts. Vladimir Zhirinovsky, the leader of the Liberal Democratic Party, for example, has called for urgent and massive arms supplies to Syria. Indeed, an extra supply of anti-ship missiles and air defense systems could theoretically delay or even thwart the attack on Syria. Russia could strengthen Yakhont anti-ship missile systems already delivered to Syria, which have a destruction range of about 250 miles and can hinder actions of the navy of the allies. As for additional air defense systems, experts believe that the Syrians simply do not have time to deploy them before the attack, whereas the use of Russian military personnel to this end would mean entering the conflict on the side of Damascus. Moreover, any urgent supplies of arms would lead to a further deterioration of relations with the West. However, as long as the bombing has not begun, there is hope that common sense will prevail. U.S. President Barack Obama and British Prime Minister David Cameron have yet to obtain consent from their legislatures. At the forthcoming summit in St. Petersburg, Vladimir Putin is likely to make a final attempt to explain to the "friends of Syria" how dangerous their plans are. Russia will send two ships to the east Mediterranean to strengthen its naval presence because of the "well-known situation" there, the Interfax news agency said today, referring to the Syria crisis. The agency quoted a source in the armed forces' general staff as saying an anti-submarine vessel and a missile cruiser would be sent in the coming days because the situation "required us to make some adjustments" in the naval force. The defence ministry was not immediately available for comment. UN inspectors are coming out of Syria on Sat morning. President Assad said, "Since the start of the crisis, as you know, we have waited for our true enemy to reveal itself. I know that your morale is good and that you are ready to face any attack and to save the homeland. It's a historic confrontation from which we will emerge victorious." ^^^ old news from 6 May 2013. UN secretary general, Ban Ki Moon just said (few min ago), "Diplomacy should be given a chance and peace given a chance. It is important that all differences of opinion should be solved through peaceful means and through dialogue." Turkey is on alert against possible chemical attacks from Syria and has stocked food and gas masks along their shared border, officials say. It also said a team of 100 chemical weapons experts were sent to the border area which was being screened for any signs of chemical attacks. JERUSALEM (AP) — Israeli police say thousands of Israelis are crowding gas-mask distribution facilities, readying for a potential conflict with Syria. Police spokesman Micky Rosenfeld said officers were deployed to maintain order in the northern city of Haifa, where more than 5,000 people jostled in line as they waited for their protective kits on Thursday. A sports arena there was being used as a distribution center to accommodate the crowds. The rising tension and long lines have led to some chaos. Israel’s postal service, which oversees the distribution, said an angry mob forcibly took gas masks from a distribution center in Jerusalem on Wednesday, leading to the site’s indefinite closure. Israel has also called up reservists and deployed missile defense batteries in preparation for a possible Syrian response to an American attack. 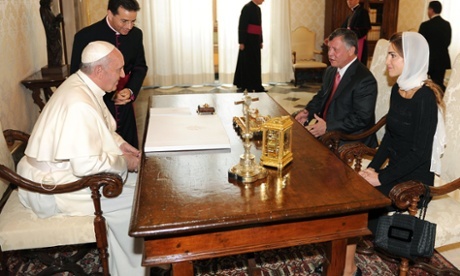 Pope Francis and King Abdullah of Jordan have agreed that dialogue is the "only option" to end the conflict in Syria, the Vatican said, after they met in Rome to discuss the crisis. Christian Aid has joined the International Committee of the Red Cross in warning of the dire consequences of escalation in Syria and has actually gone further, saying that a political solution is the "only way to achieve lasting peace". Janet Symes, Head of Middle East at Christian Aid. Cameron letter to the 'joint intelligence committee', which says it is "highly likely that the Syrian regime was responsible" for last week's attack. -- But still no proof, they are waiting for UN results. The government motion does not mention "compelling evidence on Assad", says opposition leader Ed Miliband. He also said: "I do not believe we should be rushed to judgement on this question on a political timetable set elsewhere." The Syrian air force is considering using kamikaze pilots against attacks by western forces, a Syrian army officer operating air defences near Damascus has claimed. The officer said 13 pilots had signed a pledge this week saying they would form "a crew of suicide martyrs to foil the US warplanes". The Assad loyalist, in his 30s and serving with the Syrian army's air defence section 10 miles from the capital, said: "If the US and British armies launch a single rocket we will launch three or four, and if their warplanes raid our skies they will face hell fire. "If we are unable to shoot down their warplanes with artillery, we have military pilots who are ready to attack these foreign warplanes by their own warplanes and blow them up in the air." A row has erupted over No 10's claim Labour is giving "succour" to Syria's regime by not backing the prime minister over military action there. Labour is demanding an apology for what it describes as "infantile" comments. You are going to see the new F-15 "Silent" Eagle and F-22s in action (only if necessary), Syrians don't stand a chance against them. You may see some S-300/400 in action though, once the Tomahawk onslaught begins. On the other hand, we have never witnessed Russian awe in action - even the Afghan war was plain conventional, we were awed by the Stigers if anything. Edited by Felicius, 30 August 2013 - 09:30 AM. Sorry to disappoint you but for mahdi to come a caliph must die and today there is no caliph to begin with. It looked as if Assad chemical weapon use was to sway attention or pressure away from egypts armys massacre. Assads intended or unintended calculation backfired. US bombimg of syria might not be sincere and it might be just a warm up to what to come when Islamist take over. Assad is/was losing badly and media not reporting but claiming opposit. If Assad was winning which is claimed by his supporters, I ask winning what? winning areas that suppose to be under his control and if he was winning from the start then how does he lose territories anyway?